Bubbles Never Tasted Or Looked This Good On A Car Before. Tim McIntyre of Mesa, Arizona, has owned this car for a few years now, seven to be exact. A friend, Mr. Paul, owned this ’85 Olds Cutlass and Tim at the time was ready to try his hand at building a car. Until that point, Tim had been building bikes with his grandpa “Dez.” It was these family traditions that got Tim where he is now and led to his current job as a body man at Arnold Auto Center. In his mom’s garage aptly called “The Shop,” Tim performed major surgery on the Cutty. Tim wanted to get crazy with things for his second overhaul and build something that people wouldn’t soon forget. A tilt front end came to mind for Tim. Well, it was actually inspired by all of the bad tilt front ends that Tim saw. You know, we all do it, walk by a car and tear it apart thinking, “I could do better than that.” Instead of just talking “ish” about other people, Tim set out to build a car that not only looked nice but worked well. In addition, he wanted the entire fender to come away from the car, unlike most. Like many things of this nature, it was a lot harder than it looked. Add to that the fact that the car was already painted when he decided to do it compounded the situation. But quite a bit of brainstorming and three prototypes later, Tim had a tilt front that not only worked well, but also looked great. On close inspection, the build quality on it is excellent and the hood still works. Tim shaved the firewall, which gave him an even cleaner look in the engine compartment. The body received its share of love, too, with the moldings being shaved, along with plenty of other stuff. The body received House of Kolor Lime Time pearl paint. Josh Livdahl of J Dogg Customs handled the paint gun and “Bugs” of Bugs Auto Art (both in Chandler, Arizona) handled all of the pinstriping. As an interesting side story, during the photo shoot we talked about how a couple of cars have gotten damaged, some before and some after their photo shoots. Well, maybe we jinxed Tim because a couple of weeks after the photo shoot, while trailering it home from a show, the trunk caught wind and flew off. But, no worries, as by the time you read this Tim will have a new one in place with improvements. Nothing can keep this delicious bubble from rising to the top. BubbliciousOwner: Tim McIntyreVehicle: ’85 Oldsmobile CutlassCity/State: Mesa, ArizonaClub: Sophisticated Few C.C. Engine/Drivetrain: Tim detailed out a ’68 Chevy 350-c.i.d. V-8 with some go-fast goodies and chrome, and then connected it to a detailed Turbo 350 transmission. His friend Danny did a single-in/dual-out Flowmaster chrome exhaust. Body/Paint: Tim’s body mods include a tilt front end, shaved moldings and cut-out trunk. 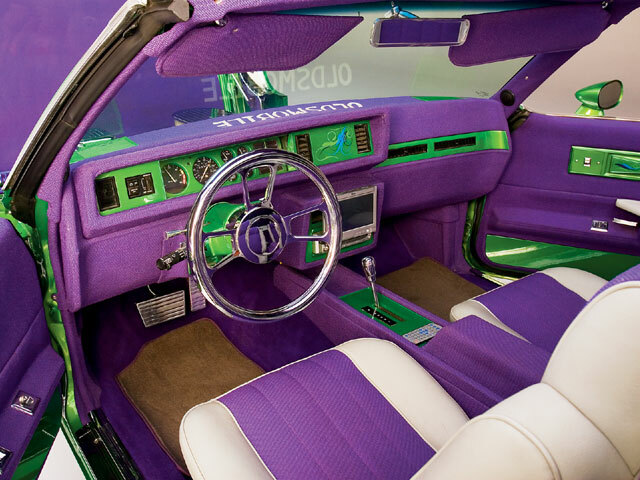 Josh Livdahl of J Dogg Customs applied the House of Kolor Lime Time pearl paint and “Bugs” of Bugs Auto Art (both in Chandler, Arizona) handled all of the pinstriping. 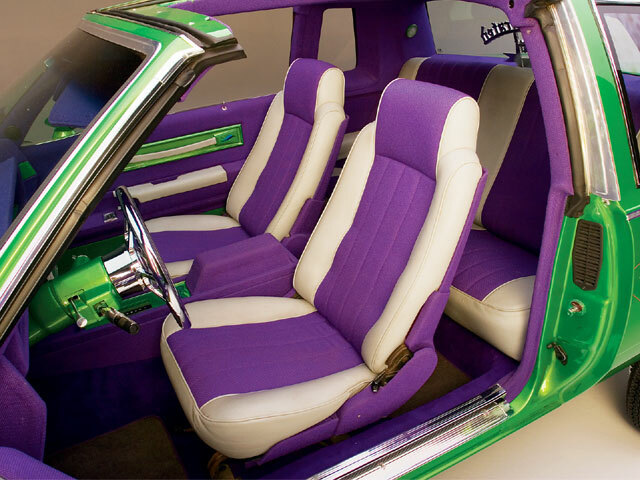 Interior: Lorenzo at Lorenzo’s Upholstery in Mesa used purple tweed and gray ultra leather with green-painted pieces to tie the car together. 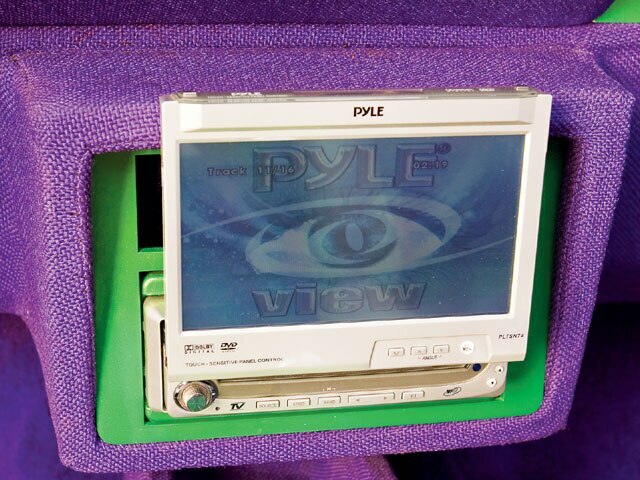 Sound System: Tim, Josh Livdahl and “G-Unit” assembled a combination of Niche and Alpine products. Setup: The four-pump Orly’s setup seems to hang in the air via a frame built to hold it. 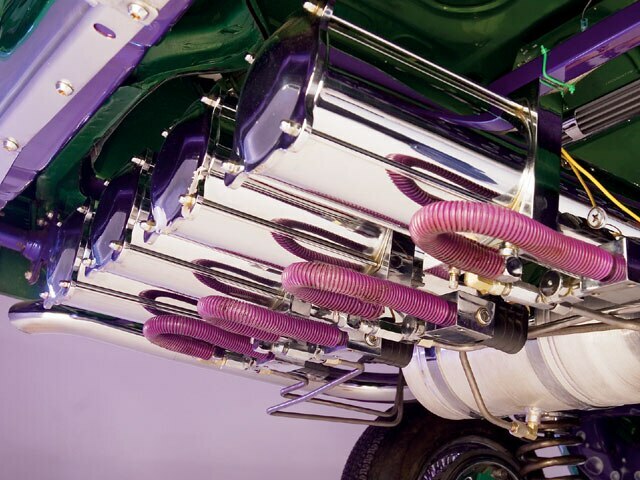 Tim installed the setup himself utilizing Orly pumps, cylinders and six Optima Yellow Top batteries painted purple with bubbles.